Man Architecture recently unveiled a colorful pop-up building made from 15 shipping containers on Île Seguin in Paris’ western suburbs. The temporary cargotecture building serves as a pavilion for Renault cars, and it can be modified or relocated when the exhibition has come to a close. 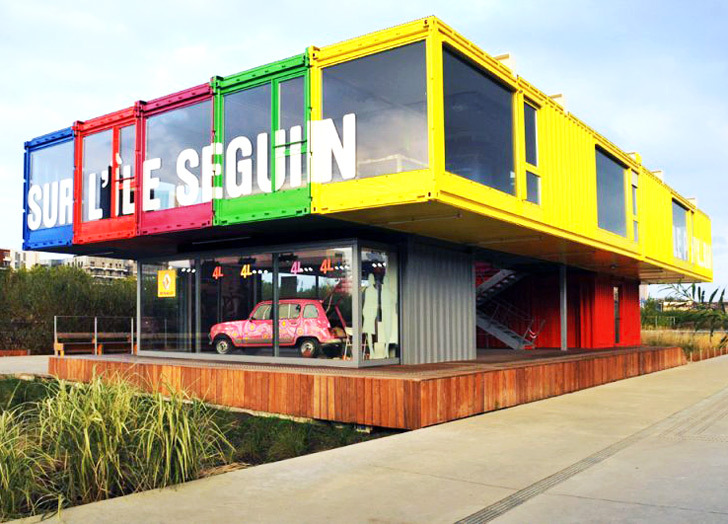 Built within a redevelopment project by Atelier Jean Nouvel on Île Seguin, this colorful maritime pavilion educates visitors about Renault cars. It’s made from 20 and 40-foot-long corrugated steel boxes, all of which measure the same height. The sturdy boxes were outfitted with windows that let plenty of natural light in, and the entire complex was constructed with very little waste. Mounted on a wooden platform, the pavilion hosts an exhibition dedicated to the history of the old Renault factories — some of which were located on the same island. There is also space for a meeting room, offices, a shop and a restaurant with a long communal table that makes the most of the containers’ length. Once again, architects have proved that shipping containers can be repurposed as affordable, sustainable building blocks for temporary modular structures. Built within a redevelopment project by Atelier Jean Nouvel on Île Seguin, this colorful maritime pavilion educates visitors about Renault cars. It's made from 20 and 40-foot-long corrugated steel boxes, all of which measure the same height. The sturdy boxes are outfitted with windows that let plenty of natural light in, and the entire complex was constructed with very little waste. Mounted on a wooden platform, the pavilion hosts an exhibition dedicated to the history of the old Renault factories -- some of which where located on the same island. 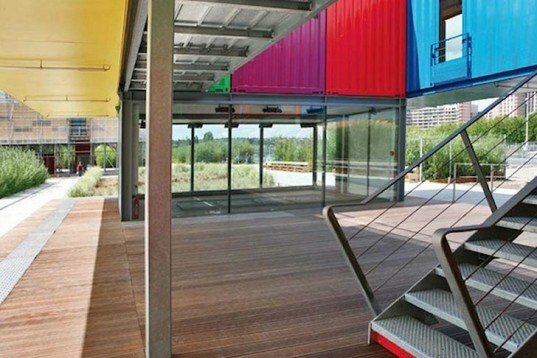 There is also space for a meeting room, offices, a shop and a restaurant with a long communal table that makes the most of the containers’ length. Once again, architects have proved that shipping containers can be repurposed as affordable, sustainable building blocks for temporary modular structures.